Edelveis celebrate Kyrgyzstan League title beating Guiness 66-35. They grabbed a 16-11 lead and added an 18-9 rally before the halftime. Moreover Edelveis scored 26 points in the third period and limited the opponents to just 6 points. Gilina top-scored for the winners with 13 points and Kulik posted 12. Mesentseva followed them with 11 points in the winning effort. Kristina Nekrasova replied with 13 points and 14 rebounds in a loss. Edelweis keep the perfect record in Kyrgyzstan League. They improved to a 6-0 record beating Tokmok 72-33. Gilina top-scored for the winners with 32 points and 13 rebounds, while Mezenceva posted 14. Aiza Mambetalieva replied with 20 points in the losing effort. Guiness meanwhile edged Tokmok 94-22. Karimova top-scored for the winners with 24 points. Politekhnik won 2016/17 Play-offs beating in the Final game Edelveis 58-55. They posted a 17-10 run in the first period, while the opponents replied with an 18-10 rally in the second period. 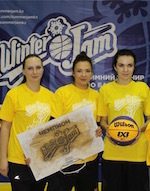 Only due to 13-9 run, Politekhnik sealed the total success. Earlier in the semifinals Molodezhnaya Sbornai lost to Edelveis 52-60. Politekhnik edged Guiness 55-47.